You have servers, and you’re debating whether to colocate or keep them on-site at your business headquarters. Small businesses sometimes store their servers and network operations in a server closet, while larger enterprises often build their own mini data center, consisting of a room or two. On the other hand, colocation is an all-inclusive service where you provide the equipment, and the colocation provider hosts it in their data center and provides the space, power, ping, and rack. Building vs buying: which is a better investment for your enterprise? Let’s take a closer look. CONNECTIVITY COST: The immediate difference between colocation and a small in-house data center will be seen once the network is connected. The serious colocation data centers are carrier-neutral, guaranteeing an always-connected network. Small businesses will have to settle for one carrier, at whatever rate they currently charge. You will need the fastest transfer speeds possible, and some carriers may not even allow excessive bandwidth. For large enterprises, fiber installed to your mini DC will cost on average $10,000 per mile to reach your location. Your operation likely needs fast transfer speeds and to avoid bandwidth bottlenecks. Depending on your location, a residential-class connection may not be good enough. Also, some ISP’s may restrict you from hosting a web server with too much bandwidth. This could be an ongoing problem because as your company grows, your bandwidth must increase with it. EQUIPMENT COST: First of all you will need a server rack for equipment storage. A uninterruptible power supply fed by backup generators is also required for short-term power when the other power source fails. Battery backups on everything from routers to switches must also be ready for little downtime. Climate control is a big part of maintaining servers for redundancy. This will require multiple air conditioning units (not box fans) that are independent and not connected to the main building system in the event of a shutdown. The unit must be a decent amount away from the servers, so that there’s no risk of condensation or leaks. You will also need to pump out and remove the water from the AC every so often. SECURITY COST: Most businesses’ in-house server security consists of a locked room accessible by few people. While this is a start, multiple layers of physical security is ideal for you and your customers data and information. This includes an alarm system, closed circuit cameras, biometric scanners, and on-site security. For more information on physical server security, check out our history of server room heists. Virtual security is another cost to consider. A firewall is highly recommended to protect your network from incoming attacks. Over 7,000 DDoS attacks occur every day, hurting businesses with hours of downtime and millions of dollars. Check out this nifty calculator tool by intel to get an estimation on how much you will be spending with a new build versus colocation. 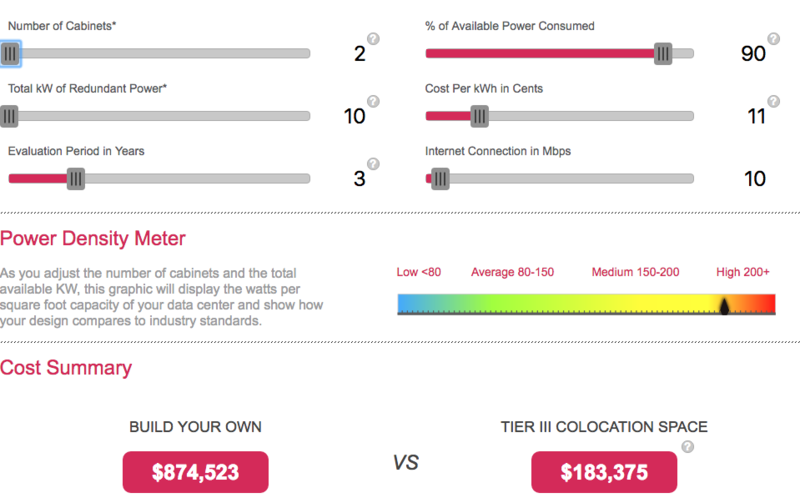 With 2 cabinets in a Tier 3 data center, here is the price estimation contrast for a three year period. The bottom line is that it is more cost effective to utilize a data center, as all of the above costs are rolled into one monthly price. Your office real estate is precious. Turn your server room into something more productive, move all the equipment out, and find nearby colocation. 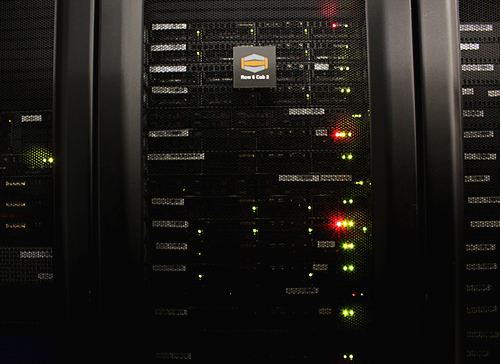 If you have outdated hardware, retire your gear and buy some customizable dedicated servers ideal for your operation. HostDime’s Orlando colocation facility includes complete redundancy in power, network connectivity, and unparalleled security and safety. If you live or are going to be in the Orlando area and would like to tour our facilities, please give us a call and we would be more than happy to accommodate you in our Orlando colocation data center. Our colocation facility is located just off I-4, allowing easy access from anywhere in central Florida.